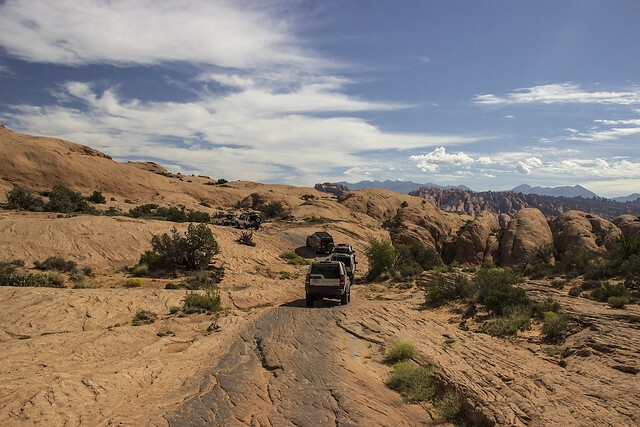 The only way fully appreciate Moab is to see it with your own eyes and experience it yourself. The terrain and views from the trails are unbelievably gorgeous. The area is on the bucket list of every offroader and near the top of the trail list should be Poison Spider Mesa. The staging area was located west of town near the Colorado River. We traveled about 6 miles south on Potash Road were we found a good-sized parking area for trailers along with a restroom and some historic Dinosaur tracks to view. We started the rocky climb up the switchbacks from the parking area. The trail had a short smooth section before we reached “Tie-Rod Flats” which can only be described as unorganized mountain speed bumps. Next was the “Water Fall” which usually puts up a fight for most vehicles. To our surprise the UTV scampered up without hesitation. Quickly after that came the “V-Notch” (shown above) and with careful tire placement looked much worse than it really was. A few more ledges then the trail had another short smooth section allowing us to catch our breath. 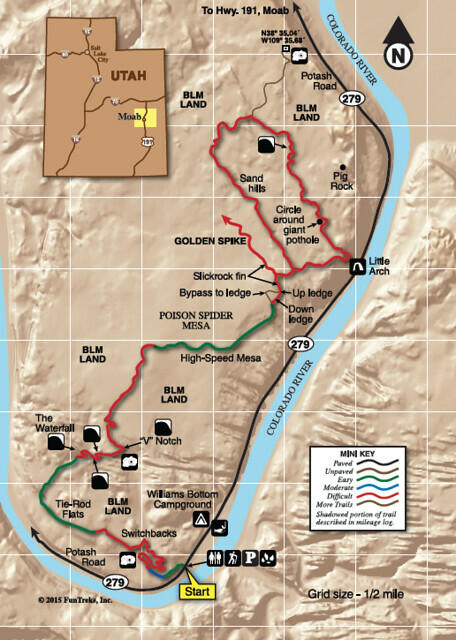 The first 5 miles of Poison Spider Mesa shares the same route with the popular Golden Spike. We turned right following the letters “P.S.” painted on the ground. Most people go counter-clockwise around the loop, but we decided to go clockwise knowing that the trail was a little easier to follow this way. The trail weaved around rock outcrops on some really fun terrain. We stopped and took a few extra minutes to enjoy spinning our wheels in the sand hills. The timing and weather were perfect, so we drove out to the optional scenic overlook and had lunch. After lunch we continued riding south on more beautiful terrain over steep rocky climbs and around a large pothole. Before heading back to the parking area, we stopped off to see one last attraction namedv Little Arch. Poison Spider Mesa is one of our favorites because its packed with technical challenges, some fun driving with many great sites a long the way. Rated: Difficult, Trail has many high rock ledges and off chamber spots. For advanced riders. Route finding is challenging, look for “P.S.” signs and follow white dashes on rocks. Time and Distance: Almost 15 miles, allow 3 hours. Staging: Unload at main parking area. 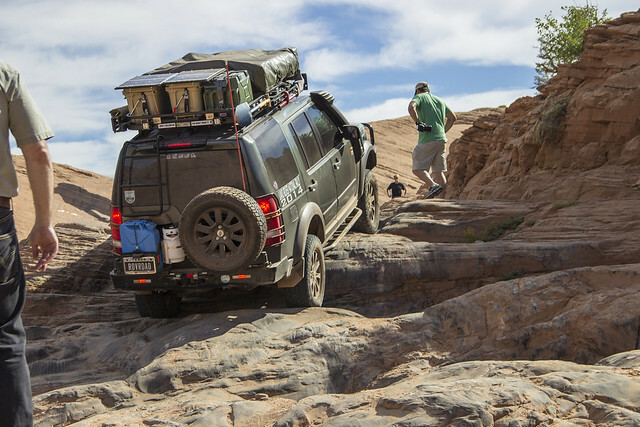 This is a simplified description of Trail #28 in Guide to Moab, UT Backroads & 4-Wheel-Drive Trails 3rd Edition. To learn more, go to www.funtreks.com or call toll free 877-222-7623.